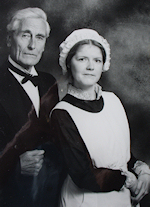 The Lymington Players were founded in 1926 when, one rainy spring afternoon, a group of young people met at Swiss Cottage, then the home of Miss Mimosa Watson in the Lower Buckland Road, to read a play. So enthusiastic were they that there and then they decided to form an amateur dramatic group and the Lymington Players were born. Their first play, A. A. Milne’s ‘Make Believe’ enjoyed a two day run in July 1926 at the old Parish Hall, Each performance played to packed houses and enthusiastic audiences. With a cast of about thirty, the audiences, it seems, were made up of largely of relatives and friends! News of the Lymington Players quickly spread and soon the company was playing to much wider audiences. From 1926 until the outbreak of war in 1939 some forty-five plays were performed on a stage with a definite slope towards the audience. The front row sometimes received a surprise in the shape of a “run-away” prop! By 1945 the very small capital reserve which the Players held at the outbreak of War in 1939 had largely been dispersed in the intervening years on subscriptions to the British Drama League and on remembrances to Players serving in the Forces. Peter Langham-Browne, who had been elected the Hon Secretary in 1938, felt the need to restore the Players’ finances by appeal to those members still in Lymington. This appeal, made early in 1945, was successful and when the immediate future could be predicted with greater certainty a meeting was called in February 1946 in the Parish Hall to discuss the resumption of the Players’ activities. The meeting was attended by 56 people and there was great enthusiasm to start producing again. This led to the Players’ first post-War play ‘Pink String and Sealing Wax’ performed at the Parish Hall in 1946 from the proceeds of which donations were made to the Lymington Community Centre and to Lymington Hospital. The Lymington Players were thus well and truly on their way again. For many, however, the post-war period presented a variety of problems created by the general shortage of goods and services. The Lymington Players were no exception to susceptibility to these shortages: in 1947 a note was sent to all members indicating that “owing to a Petrol Ban it was not practical to give an Autumn Show. Any complaints direct to Mr Shinwell please”. 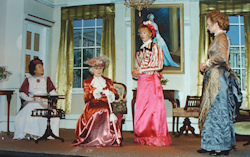 Following the production of ‘Pink String and Sealing Wax’ in 1946, two or three plays were staged annually, the 50th production by the Players since inception being performed in November 1949 – another A A Milne play, ‘The Truth about Blayds’ produced by Charles Lancaster at the Parish Hall. The play was dressed in contemporary style as the cast thought the 1921 fashions called for were too unbecoming! Plays including ‘George and Margaret, ‘Quiet Wedding’, ‘See How They Run’, ‘Arms and the Man’, ‘The Crucible’ and ‘Flowering Cherry’, amongst many others, followed, staged at the Parish Hall. 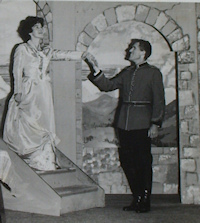 Productions of a wide variety of plays continued at the Parish Hall and included ‘Ladies in Retirement’ (1955), ‘Quiet Wedding’ (1957), ‘Pygmalion’ (1960) and ‘Arms and the Man’ (1963). Meanwhile at the Lymington Community Centre a new group, the Centre Players was making a name for itself, staging Shakespeare. In 1965 after discussions the Lymington Players and the Centre Players decided to unite and ‘The Lymington Players’ found a new home in the Malt Hall Theatre. The Malt Hall is a proper little theatre with a raked auditorium. The space is shared with the Centre Cinema. The stage is tiny, and the back-stage accommodation is small, but there is a tremendous advantage in being able to use the stage for rehearsals. Today, the Lymington Players still performs three plays a year, (in November, February and April), aiming at a varied season of comedy and drama, and including plays with a serious topical theme. A number of social events throughout the year are also organised, including lively monthly Club Nights. A weekly play-reading group meets in term-time, also at the Centre. With an excellent reputation, the Lymington Players welcomes new members of all ages and continues to entertain the people of Lymington.